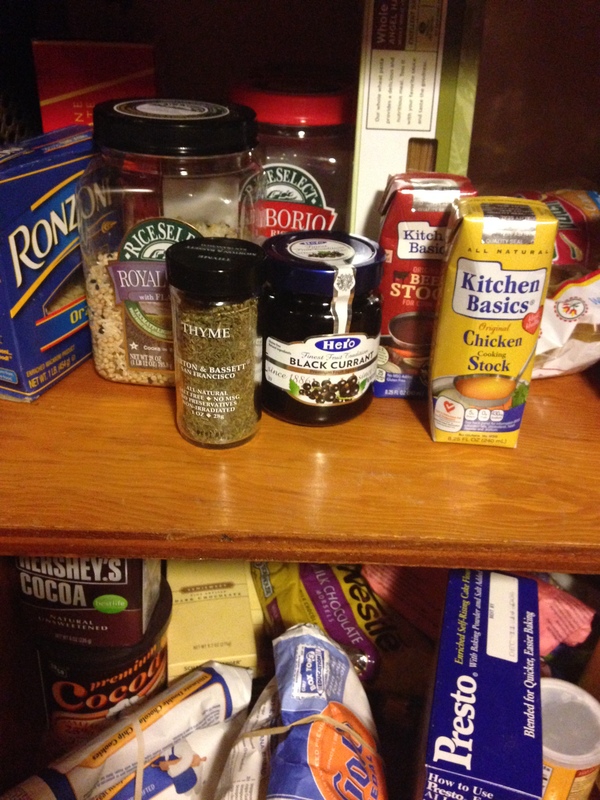 These are the items I have in my pantry, so I am ready for anything. TIP: Don’t store your potatoes and onions near each other or the potatoes will rot quickly. Dried pasta (the kids like trio pasta, I love the spaghetti that appears to have gotten a perm (Ronzoni offers this). Also, I usually stock whole wheat or high fiber linguini, spaghetti and angel hair; and, some penne, fusilli and ziti). Basics: Lemon pepper, ground pepper and whole peppercorns, Sea or Kosher salt, regular salt for baking (think the lady with the umbrella), baking soda, baking powder, cream of tartar, packets of plain gelatin, packets of yeast. Booze for cooking with: Marsala wine, Dry Sherry, White Vermouth, Vodka (for sauce, yes…but also to bribe the dishwasher), dark or amber beer for stews like Guinness or a new IPA like Dogfish Ale (can also help to bribe the dishwasher) and red and white table wines. For Baking: Unsweetened and Semisweet bars of chocolate, cocoa powder, chocolate chips, sweetened coconut flakes, graham crackers, mini-marshmallows, flour, self-rising flour, sugar, brown sugar, confectioners (icing) sugar, honey, real maple syrup, molasses, corn syrup, vanilla (Madagascar only), almond extract, raisins, quick oats. Walnuts, almonds and pecans. Tip: Store nuts in the freezer for a longer shelf life. Booze for baking with: Kahlua (add to all sorts of chocolate desserts to bring out the bitterness in the chocolate), Cherry Brandy and Frangelico (Hazelnut liqueur). Granola bars, apple sauces, boxes of raisins, nuts, Nutella with little cookies (fabulous invention), pretzels, all natural juice boxes and organic milks. Nacho chips and natural salsa, whole grain crackers (I like Breton, great with a smoked gouda or herb brie), cashews, mixed nuts and some type of kid’s snack like Pirate Booty or Skinny Popcorn.